Q: On the view of my Standards Based Report Card, I am getting a "P" for the mark. What is the problem? A: On the SQL Reporting Engine server, the "WingDings2" font needs to be installed. This will translate "P" into a checkmark. This is a free font bundled with most installations of Microsoft Windows. As with any new font, you will have to reboot your server after installation. Q: Is Aeries SIF compliant? How can I get more info on SIF compliance? A: Yes, Aeries is SIF Compliant. If you would like to implement the Aeries SIF Agent, you need to contact CPSI at http://www.cpsiltd.com/. Q: How do I setup the option for importing Blackboard data into ABI Gradebooks? Q: How do I clear out the workstation IP Addresses that are locked out due to invalid login attempts. A: You can delete the IP address information from the GBL table. Q: Some of my teachers report that page breaking doesn't work properly on ABI reports. A: The global way to help this situation is to change the Default page for the ABI directory in the IIS Manager to "login.asp" from "default.htm". That may help some people. If that does not work for all your users, it may be their version of Internet Explorer. If they are using IE8, they will need to enable "Compatibility Mode" when using the ABI website. Q: Where do I put my student pictures so that they are seen in ABI? A: Within the web server's ABI directory, place the photos in a \images\school#\ folder (where school# is your school code without leading zeros). All of your photos must be in JPG format. Q: Why is it that when I connect to my ABI website, I am prompted to login using a Microsoft Windows login window. A: The MS Windows login prompt identifies the problem as permissions to the web folders. Verify that the "IUSR_MACHINENAME" account has explicit, full control permissions to the \INETPUB\WWWROOT folder, including all child folders and files. Q: How do I increase (or decrease) the auto-logout time in ABI? A: This is a feature of IIS (Internet Information Services) - which is the webserver that ABI runs on. You have to go into the IIS Manager on the server and then restart IIS once finished. Q: Why do I get the error message "Cannot Open Database ". when performing an update to my ABI? A: This error message is specific to ABI setups using Access 2000 or Access XP. The ABI install update program that is loaded on your server is the version used for Access 97. This program can be uninstalled and the correct version can be downloaded (UpdateABIXP.exe) and installed to clear up the error. Q: Why cant I see the "Overwrite Valid Marks?" checkbox when entering grades into ABI? A: The checkbox will only appear when the active, valid mark selected is identical in both Aeries and ABI. Q: On ABI with AeriesCS, when accessing the Contacts, testing, or transcripts modules in ABI I get a message that starts with Invalid Column Name..."
A: Open the AdminCS interface and run the "Define Student Table Relationships" module. Once finished, exit the module by selecting Close Form and Apply Changes. This will rewrite the records in the TFR table, which will clear the error. A: Reason: You didn't translate your codes correctly. Resolution: Use the Code Value Translations tab to account for EVERY code used by Aeries. If the error is occurring because of values that are not in the COD table, use the Update Code Table form or Query to identify all the values in the Aeries field. You can then either adjust the values, adjust the codes, or translate the invalid values. A: Reason: Enrollment Record for this student was not posted to CALPADS. Resolution: Do not submit SINF files until your SENR file has been posted without any errors (or with very few errors). If this student was the student with an SENR error then that is the problem. It could also be that you uploaded the SINF file before the SENR file posted. You should wait 1 to 2 days AFTER you post the SENR file to upload the SINF file. And then you should wait 1 to 2 days after the SINF file posted to upload the SPRG file. A: Reason: CDS codes in LOC are wrong. Resolution: Use the School Options form to verify and adjust your CDS codes. A: Reason: The CSE table is not populated with the "School Code" of the NPS school the student is attending. Resolution: Populate the "School Code" (CSE.SS) field on the Special Ed form with the NPS school the student is attending. If the student is no longer attending an NPS school, you still need to have the NPS school populated in CSE. This may be changed in the future to store the NPS school code in the ATT and ENR tables. A: Reason: CALPADS is resticting the characters in the current field. Resolution: This normally happens with the Parent-Guardian Name (STU.PG) field. Remove non-alpha characters from this field and re-extract. A: Reason: There could be many causes for this issue. Resolution: Check the school and district calendars for invalid or incorrect dates. Check to make sure you haven't translated a Blank Exit Reason or Completion Status to something. Make sure the student doesn't have an HSG or EOY value populated. You may also need to "Fix ENR" from AdminCS or re-update your Access district database. Resolution: Check the school and district calendars for invalid or incorrect dates. Check to make sure you haven't translated a Blank Exit Reason or Completion Status to something. Make sure the student doesn't have an HSG or EOY value populated. And of course check the student leave date and graduation date fields for correct values. You may also need to "Fix ENR" from AdminCS or re-update your Access district database. A: Reason: You have a graduate who returned. Resolution: Aeries does not support assigning a "Completer Code" to a particular enrollment record. If a student "Graduates" and then returns to the same school in the same year, you need to remove the Graduation Status and Graduation Dates values and enter that information in the Transcript Comment area. When the student finally completes the school year and leaves permanently, you may re-enter the Grad Status and Grad Date. A: Reason: A bad EOY value. Resolution: Check the EOY or last Exit Reason for the student and make sure it is "230" for any student with a Grad Status value. A: Reason: CALPADS still thinks there is another Primary Enrollment for this student at the same time as the record you are sending. Resolution: First, this error may be caused by a different SENR record in the file getting a fatal error. So you should only worry about this error if there are no other errors in the file. But if you have gotten that far, make sure you completed the Reconciliation for 08-09. That means you have gone through the ODS Audit as well as the Enrollment Update for 08-09. You should also double-check your Enrollment Status code value translations. You need to translate any "Secondary Enrollment Codes" correctly. A: Reason: Incorrectly populated data. Resolution: Check the attendance and enrollment history and make sure that the student has a correct Exit Reason and populate a Next School if necessary. You need to also make sure that the Next School chosen has a full 14-digit CDS code populated in the CHI table. Resolution: Run the "Update College Entrance Requirements" Macro. A: Reason: Bad CDS code in Aeries. Resolution: Check your LOC and CHI tables for full 14-digit CDS codes on all appropriate records. A: Reason: LAC.ELP field is blank. Resolution: This field is required for RFEP students. Either manually populate this field for your students or run the "Update English Language Proficiency (LAC ELP)" Macro and then verify students marked with an "N". A: Reason: LAC.USS is blank. Resolution: Students born outside the US and Puerto Rico must have the US School Entry date populated. A: Reason: SSD.SUS is blank. Resolution: Students born outside the US and Puerto Rico must have this field populated. You must populate this information by hand or use a Query to look at students where the LAC.USS value is less than 3 years ago and populate those students with a "Y". "Y" means that the student has been enrolled in US schools for LESS THAN 3 years cumulatively. "N" means the student has been enrolled in US schools for MORE THAN 3 years cumulatively. An "N" can not be determined in mass because of potential gaps in enrollment since the US School Entry Date. A: Reason: Incorrect data in Aeries. Resolution: Check enrollment data for the student. Check the school and district calendar for incorrect dates in ANY month. A: Reason: Student Data being sent to CALPADS doesn't match what CALPADS already has. Resolution: There is a known CALPADS issue with this, although it can happen if students change names or if you correct a Gender or Birth Date. This is also known to happen for students with non-alpha-numeric characters in the name fields. A: Reason: Missing data in Aeries. Resolution: EL students need to have the Start Date on the Language Assessment screen populated. IFEP students need to have "IFEP Date" populated and RFEP students need to have "Redesignation Date" populated. A: Reason: Missing STU.INE value. Resolution: All students in grades 9 and above need to have the STU.INE field populated. You can do this in mass using Query and then make adjustments for any student who was held back. Resolution: Students who were part of the Homeless program for ANY time during the school year need to continue to have the "Home Type" (SSD.HMT) field populated with the homeless dwelling type through the end of the school year. You also need to post the SINF file with that information, then wait 1 to 2 days to upload the SPRG file. Resolution: Code 122 (NCLB Title 1 Part A Basic Targeted) need to have Services (PGM.SR) populated on the PGM record. A: Reason: An invalid code is getting through to CALPADS. Resolution: Make sure you translate all of your non-CALPADS Service Codes to a blank. This includes all the old CSIS codes. Resolution: Code 113 requires that you populate the CA Partnership ID in the PGM record. Q: Which Exit Code should I use when exiting a student from a "Secondary Enrollment?" A: CALPADS recommends using code "400 - Other". Resolution: Populate the required data fields in Aeries. Sometimes the field identified by this error is conditionally required and the field driving the current field's requirement might be incorrectly populated. Consult the CFS if this one gives you trouble. Q: Do I need to work from a "Snapshot" database? A: No. Make a backup of your database(s) on Info Day and place it aside, just in case you need to come back to it. You shouldn't need this backup, but it doesn't hurt to have it. Continue to work out of you live database and extract data from your live database. Q: Which Reconciliation Approach should I use? A: Aeries districts should use Approach #1. Aeries has a built-in reconciliation process called the ODS Audit. Refer to the Getting Started with CALPADS document for more information. Q: What do I do if I did not do the End of Year Enrollment Update in CSIS? A: First check with CALPADS to find out what they will require. Because the Start Date values for last year's students will probably not match what Aeries thinks the Start Date should be, you need to be able to do a ODS Audit process for last year's students or you need to manually update that information in CALPADS. The only alternative is to do an Enrollment Update from Aeries and manually adjust the file to make sure the Start Dates match. But that process would probably be more cumbersome than just updating the records in CALPADS. The easiest way would be if the ODS Audit process could work against last year's data, but you need to verify that CALPADS will accept it in "batch" format. A: In Aeries, we call this process the "ODS Audit". It will take data from CALPADS and compare it against the data in Aeries. It then creates a file to be submitted to CALPADS to correct the data in the CALPADS ODS. That way, subsequent enrollment update submissions will be more successful. See "Getting Started With CALPADS" documentation for steps to complete the process. Q: Do I need to convert my existing Ethnicity information to the new Race and Ethnicity fields? A: No. The CALPADS extract from Aeries will convert this information on the fly. But for certain reports in Aeries, you need to convert your existing data to the new fields. You can do this by using the Macro called: "Populate New Race and Ethnicity Fields." Q: Where do I find the ART (CSIS Academic Records Transfer) extract form in Aeries? A: Records Transfer is still a CSIS function of the SRRTS systems. At the school level in Aeries, go to View All Forms, add filter, type in "CSIS", Open Create CSIS Data Files, "Create Records Transfer File" tab. Also, on our website under Support, Documents and Downloads, in the CSIS category, look for Records_Transfer_File_Layouts_K12_to_K12.pdf. This will give you K12-K12 Records Transfer Submission File Layouts. Q: Special Ed enter date/ I have been putting in the date that student first received services in Special Education instead of the date they enrolled in my program. Do I need to change this? A: No, you should enter the date of their initial IEP. Q: If the Race and Ethnicity for a student is "Intentionally Left Blank" do we have to create a code in the Code Table for this item or can we just leave it blank? A: Eagle Software advises that you create a code in the Code Table for this so that you can make sure that the field is populated correctly. Leaving it blank makes it difficult to determine if the field was left blank intentionally or in error. But, blank values will be correctly extracted to CALPADS if they are there. Q: What student grade levels need to be translated on the Code Value Translation tab in Aeries? A: The extract from Aeries will automatically translate grade 0 to "KN" and will automatically add the leading zero to grades 1-9. You only need to enter translation values for grades higher than 12. Q: When doing the ODS Audit process, I click on the "Evaluate Records and Create New SENR File" button. Then I get a message: "SENR File created. 0 Records Extracted". Why? A: You probably selected the wrong File Delimiter when you imported the file. Change the selection and re-import the file. It might also be that you did not have any schools selected from the list on the right-hand side of the form. The ODS Audit process will only evaluate the schools selected. Q: What do I put into the "STU.ED Use Date" field on the Create CALPADS Extracts form? You need to first, figure out how good your ENR data is. Determine the date after which data in ENR is good. Put that date into the "STU.ED Use Date" field. Determining the "goodness" of your ENR table is not something that Aeries support can do for you. You need to do that on your own. You need to figure out how long you have been on Aeries and how long you have been updating your district database. If you have incomplete ENR data, you can go back into prior years, build the ENR data in that year and then use the form: "Pull ENR From Another Database" to copy it into the following school year. Continue to do that until you get to the current year. Then you have good ENR data going back to the school year you started with. Q: How do I import my SEIDs? A: In the Aeries District software, open the Create CSIS Data Files form. There is a tab called "Load SEID" that can be used to import the SEID values into the Aeries Staff (STF) table. Q: How do I know if I need to perform the "Data Reconciliation" process? A: All districts need to perform a "Data Reconciliation" when you start using CALPADS and should be done at least once every two months thereafter. Please refer to the "Getting Started with CALPADS" document: http://www.aeries.com/Support/downloads.asp?catid=886914049. Q: What are the quick steps for performing the Reconciliation process. A: In Aeries, this is called the "ODS Audit". The first step in the process is to go to CALPADS and get the file from them. Then you import the file into Aeries, let Aeries process the data and create a new file. Then take that new file and send it up to CALPADS to fix their data. You can find more detailed information in the "Getting Started With CALPADS" document here. Q: Do I need to enter an NSLP Free and Reduced Start Date? A: No. If you leave the Eligibility Start Date empty, Aeries will use the current enrollment range and school year to extract that information. Q: Can I do an Identifier Request without getting all the code translations and the STU.ED Use Date in? A: Somewhat. Code Value Translations and all options need to be populated before performing any CALPADS Extracts. But for new students, the "STU.ED Use Date" won't be a factor because for new students, their STU.ED date should be very recent and the ENR data for those students should be valid for this school year. Q: Can you explain why both Student Enter Date (STU.ED) and Enrollment History (ENR) are used for reporting Student School Enter Date to CALPADS? A: Student School Enrollment Start Date is the single most important value in CALPADS Reporting. If the system can't figure out when a student started attending a school, nothing else matters. That is why Aeries gives you the option of having either good ENR data or good STU.ED data and provides a threshold for determining when to use these two resources. Your ENR data should always be accurate for the current year because it is managed on the fly by Aeries. It is getting good data for prior years that can be difficult. Q: How do we manage the local mapping of our courses to the Course Group State codes as provided in the CALPADS code sets? A: On the Course table in the bottom right you will see a CBEDS number field. That is the Course Group State field for CALPADS and the numbers are correct but many are listed that say "No Longer Used" because they were dropped. Also, you can use 6012 for courses you do NOT want to report and Aeries will know not to extract them. Q: Is there any documentation to explain what the codes mean for MST.HQT, the Highly Qualified dropdown? A: You can use the CALPADS Code Sets document and various NCLB documents to determine which value to use. You should also consult with the person in your district in charge of credentialing. Q: What are the Deadlines for CALPADS? A: You can find this information on the CALPADS Website: http://www.cde.ca.gov/CALPADS. Q: Do I need to delete Classified staff from the STF Table and leave Certificated only? A: No. As long as they do not have any STJ (Staff Job Assignments) records, they will not be extracted. Q: For Student Primary Residence Code (SSD.HMT) do I have to populate this field for every student? A: This is a Required Field in CALPADS, but using the Code Value Translations tab on the Create CALPADS Extracts form, you can translate a Blank to "200" (Permanent Housing). This information is not analyzed by CALPADS until the end of the year, so by the end of the year, you do need to evaluate all of your students and populate actual values for the sake of accuracy. Q: How to set up security for site users who now need access to District for CALPADS access? A: Your schol level users should not need access to the district database because all information can be input from the school level. Eventually, Aeries will allow site-level users to create their own SSID Request files, but this will only be enabled after CALPADS stabilizes. Q: I am trying to add new SSID #s received from CALPADS into Aeries and getting an error that this is not a valid CSIS number. Why am I getting this and how do I fix this? A: SSIDs assigned by CSIS used a different validation algorithm than is being used by CALPADS now. 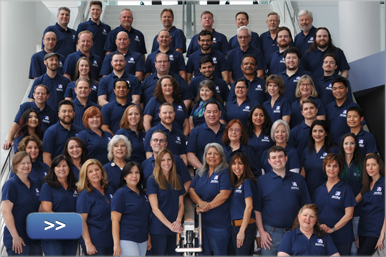 Eagle Software is working with CALPADS to determine their validation rules and will implement them into Aeries as soon as possible. Until then, you need to import the SSID results into the system using the batch method, or use the Query Change form to enter the value. Q: If we currently house our NSLP (Free and Reduced Meals) eligibility data in the FRM table at the school level, does the CALPADS extract look at the FRM table for data? Or do we need to move this data to the FAR table at the district level? A: Currently the CALPADS extract only looks at the FAR table in the district database. This information is not currently be used by CALPADS. An option will be added to the extract form to pull this information from either the school level FRM table or the district level FAR table. Q: I don't want to use code "F" and "R" for Free and Reduced Meals Eligibility. Can I use different codes? A: Currently only the "F" and "R" codes are acceptable for CALPADS reporting. This might be translatable later as the extract system is enhanced. Q: Do you know if there is a code for teacher assignments for grades 9-12 Special Ed self-contained? Also, where are Elementary course assignments now coded? A: There is an Other Fields Tab on the TCH table....that is where you add a CBEDS code of 1000 to all Self-Contained Classes and the on the Instr. Strategy there is a flag for Sp Ed. Q: What CBEDS Code should we use for "Lunch"? A: Use code "6012" and Aeries will automatically skip this course and not extract it. Q: What do I do if I have a course section that falls into more than one Instructional Strategy and one of those is Special Education? A: For the 09/10 reporting year, if you have a course section that falls into more than one Instructional Strategy and one of those strategies happens to be special education (special day class), then you should select special education. Special education should trump all other strategies. In future years we will revise the CALPADS specifications so that you can submit these independently. Additionally, if the choice comes down to choosing between the EL strategies and home and hospital strategies, then select Home and Hospital. Q: What if the Instructional Strategy is English Learner? A: The CALPADS English Learner Accountability Office decided that they did not want to establish a "ranking order" for the EL strategies, so please use the one code you feel is most appropriate for the 09/10 school year. This is a local call. CALPADS will amend their program for the 10/11 school year so that they can capture that multiple strategies are taught in one course section. In addition, if the choice comes down to choosing between the EL Strategies and Home and Hospital strategies, then select Home and Hospital. Q: Do we have to report Infants in CALPADS? A: School Districts each make a local determination of whether to track infants or not. Once you start tracking a student, you will always need to track that student. Q: During the ODS Audit/Reconciliation process, I import 2000 records into Aeries, but only 500 get extracted into the SENR file. Is this correct? A: Yes. Only records that need to be changed are extracted into the SENR file you upload back to CALPADS. Q: Do I need to run the CBEDS Reports in Aeries? A: No. CALPADS reporting is based completely off of student enrollment information. The old "Counted in CBEDS" flag no longer applies for CALPADS reporting. You can still run these reports for your own information, but these reports will be changing soon to reflect how CALPADS breaks down students during Fall 1 Aggregations. When these reports are adjusted, they will also use student enrollment data to determine which students were enrolled on Information Day. Q: How do I handle my Graduates and Matriculating students in last year? A: If you didn't update these students with End Of Year and Graduation Status values last year and submit these students to CSIS, you need to now go back into last year and populate the Grad Status (STU.HSG) and the Date Graduated (STU.DG) fields. You do not have to populate End Of Year (STU.EOY) values unless you want to. Aeries will automatically extract the correct Exit Reason for students with the STU.HSG field populated. Then you need to complete the Reconciliation / ODS Audit process in last year to report these students to CALPADS. Q: When I import the CALPADS ODS Download file into Aeries for the ODS Audit process, it tells me that some record were removed because of unmatched SSIDs? Is this something I should be concerned with? A: No - do not worry. 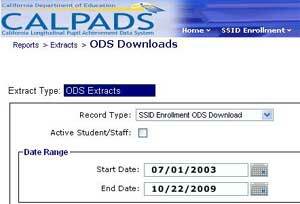 The CALPADS ODS Download file often contains students who are no longer in your district. This is perfectly normal. The message is simply letting you know how many records the system found in the file and how many will be evaluated by the ODS Audit process. There is nothing you need to do to fix anything. This is all normal. Q: How do I create the CALPADS Spring 1 submission files? A: In the Aeries District software, open the Create CALPADS Extracts form. On the Enrollment Update tab, use the Create Enrollment Update Files to create the SENR and SINF files. CALPADS is collecting data for English Learner and Immigrant counts as of the Spring Census Day of March 1st, 2011. Q: When I submit data to CALPADS, I get errors about "invalid characters". What could be causing this? A: There is a known bug in CALPADS that generates errors when the Parent/Guardian field in Aeries contains non-alpha characters like "/". Until CALPADS corrects this problem in their system, you need to open the SINF file using Notepad and replace all slash characters with blanks. Q: What Date Range should I use when creating the ODS Extract in CALPADS? A: The Start Date you should use should be "7/1/2003". It is important to use a date that encompasses all the enrollment information that CALPADS has on your students. Otherwise, you will end up getting errors in CALPADS about Overlapping Enrollments. Q: How do I generate the extract from CALPADS for the Reconciliation/ODS Audit process? Resolution: Any student in the Migrant program (code 135) at any time during the current school year needs to have the "Migrant ID" (SSD.MID) field populated with what the state calls, the "MSD Number." Resolution: Any student in the Special Ed program during any part of the year must have the Disability (CSE.DI) field populated through the end of the school year. Resolution: Any student in the Special Ed program during any part of the year must have the "District" (CSE.DR) field populated through the end of the school year. A: First and foremost, do not worry about ANY CERT errors until you can post SENR, SINF, and SPRG files consistently with few to no errors. Data that was not posted due to errors in those files are the probable cause to almost all CERT errors. The 2nd most likely cause of all of these errors is data not populated in Aeries. Reason: SENR and SINF records were not completely posted. Resolution: Perform a full year Enrollment Update and make sure that you have no errors and that all records post. It has been seen in the past that some records posted to CALPADS do not actually post to the CALPADS ODS. Reason: Missing Graduate information from last year. Resolution: Start the Reconciliation Process over from the start. Begin with 08-09 ODS Audit, then 08-09 EU, thn 09-10 ODS Audit, then 09-10 EU. Reason: Enrollment Updates did not fully post. Resolution: Depending on how extensive this situation is, you may be able to just go through the normal EU process again, but if this error is extensive, you may need to start the Reconciliation process again. See major note above. Q: Why did Aeries change the Assertive Discipline form? A: Previously, each Assertive Discipline record could store 3 different Disposition codes but there was only one set of related disposition fields (Dates, Authority Action, Placement, Return Status and Return Location) for all 3 dispositions. The major enhancement will now allow multiple disposition records to be stored with the related disposition fields. This allows the LEA to report to the State the final disciplinary action taken, as the action may progress for the student (i.e. suspension leading to expulsion). This will also allow for the disciplinary action duration to be kept per disposition, enabling the LEA to keep track of the days of suspension as well as the days of expulsion under the same discipline record. These changes are to help Districts submit Discipline data cleanly to CALPADS. Previously, some districts were creating multiple ADS records for the same student for the same incident with different Dispositions to track the student’s progression. This affected their districts CALPADS reporting. The changes made to ADS with the addition of the DSP table enable you to track all that information on a single discipline record and not have to use a work-around that caused issues with CALPADS reporting. Q: What does the “Copy Dispositions From ADS to DSP” Macro do? A: The macro will copy ADS records with a single disposition (ADS.DS) to the new DSP table. Not all Disposition records can be converted using this macro. Any ADS record that has more than one disposition and information added to the disposition fields, such as Disposition Start Date (ADS.DD) cannot be converted. We cannot determine which Disposition code goes with the entered data. The “Print ADS to DSP Conversion Audit” report can be printed to evaluate the records that did not get converted. Q: What information does the “Print ADS to DSP Conversion Audit” report provide? A: The “Print ADS to DSP Conversion Audit” report will list students with ADS records with multiple dispositions. The report should be evaluated. If the ADS records have the Days and Start and End Date fields associated with the most severe disposition, those records do not need to be converted. Q: Do all ADS records need to be converted to the new DSP table? A: If the ADS records have the Days and Start and End Date fields associated with the most severe disposition, those records will be extracted correctly in the CALPADS EOY extract and do not need to be converted. The Discipline letters, reports and CALPADS EOY Extract will evaluate both DSP and ADS records. Moving forward, it is recommended that users use the new DSP table with ADS records. Q: How do I handle loading the CELDT Corrected GRT file that I received from the testing vendor? A: Please refer to the following document for information. This will explain the current issues in detail: CELDT Corrected GRT File. Q: How do I distribute a new update to my AeriesCS users without visiting each Aeries workstation? A: The update process can be setup to automatically check a public file location that the extracted files reside in. Typically, this location is on a server and all users need full control to the folder. It can be setup as a drive mapping or a UNC, or a share. On each instance of Aeries workstation, you can go to View All forms and select the form "Aeries Variables For Current User". The form contains location that the update location is placed (Updates Path). Once an update that is newer than what is on the workstation is in the location, the update process is started automatically, copying down the necessary files to the local workstation. This works for both the Aeries School Access interface (SCH) as well as the District Access Interface (DST). One thing that MUST be accomplished by the database administrator (dba) is to update the SQL databases by using the AdminCS from the update that is being distributed. This is done by accessing all Aeries databases on the SQL server with the AdminCS and the file is updated automatically upon authentication. NOTE: Because AdminCS changes the database structure (Updates the database with new fields, table/index changes, etc), AdminCS MUST be the first thing run when implementing a new version of AeriesCS! Q: I uploaded my data from AeriesXP to AeriesCS and the supplemental data from my AeriesXP files is not there. What do I do? A: When uploading the data to AeriesCS from AeriesXP, if there are custom fields to upload, the process for redefining the SUP table in the CS database needs to be done by clicking on the "ReDefine SUP" button and selecting a database that contains the customized layout. This step will modify the SQL database to mirror the layout of the traditional Aeries SUP table. Q: What procedures do I need to follow to optimize my MS SQL server for use with AeriesCS? A: You should perform these modifications on your MS SQL server to maximize performance for AeriesCS. If you have implemented ABI on another server other than the SQL server, these modifications should be performed on the ABI server as well. Note: Modifications to a server and registry should only be handled by a System Administrator or Technician that is proficient with server maintenance and registry modifications. Install all operating system (O/S) service packs and patches that are available from the Microsoft Updates website. Make sure that your MS SQL Server has been updated with the latest service pack. There have been issues with both Standard and Enterprise versions of MS SQL Server when the latest service pack has not been applied. Update the MDAC to version 2.8 from the Microsoft Downloads website. Restart all servers (SQL and ABI) after the modifications have been completed. Q: My users want to be able to practice procedures on a test SQL database. How would I set one up for AeriesCS? A: The usage of a test SQL database is recommended by Eagle Software and pretty common with AeriesCS users. The setup of a test database is a little different than with the traditional MS Access Aeries. The process involves backing up the live database with Enterprise Manager and then restoring the backed up data to a new database with a different suffix name. The most common suffix used is to give the same suffix as the live database with the addition of the word "Test" at the end (e.g. DST13000DistrictNameTest for the 2013-2014 school year). When a user wishes to use the test database, on the login screen, the new suffix of "DistrictNameTest" would be inserted in lieu of the live "DistrictName" suffix. This gives the user a test area to work in. You can further enhance this feature and also help users to avoid confusion between databases by changing the district and school names in the LOC table of the test database to something that would prompt the user to visually realize that he/she is not working in the live database. This is important to do so that the user does not inadvertently work in the test database by mistake inserting or updating live data. Q: How do I copy my feeder school information from an AeriesXP database into my AeriesCS database? Q: How do I create a new school in my AerieCS database. A: Open the AeriesCS DST interface for the desired year and suffix. Go to School Options. Click on Add to add a new school. Use a school number currently not in use. Once the basic info has been entered, press the key to save the new school. Log out of AeriesCS DST interface. Login into AeriesCS SCH interface for the desired year and suffix. Select the new school number created in earlier step. Got to Teacher Data. Click on Add to add a teacher. Type "Unassigned" in the Teacher name and any other info you feel needs to be entered on the default teacher record. Save the new record by pushing on the key. Immediately go the "Teacher Number" (ID) field by clicking on it with your mouse and change the number from "1" to "0" Hit the key The new school is ready for use. Q: When my users of Aeries start the interface, they get an error that states "Item Not Found In This Collection". How can I solve this issue? A: "Item Not Found In This Collection" refers to the database being accessed by Aeries as having an object (table) that is not part of the Aeries database model structure. When Aeries loads data, it downloads the table data necessary and also the structure. When a table has been created by the district to import data or perhaps store data outside of Aeries, and the table name is less than 5 characters in length, Aeries produces the "Item Not Found in the Collection" error. The easiest method to find the offending table is to go to the database table view in the Management Studio for SQL interface and sort the tables by date in descending order. Most likely the offending table will be in the top two or three tables listed. Rename the table with a name longer than 5 characters in length (6 recommended i.e. FARxxx) or delete the table if not needed, and Aeries will ignore the table when loading data. Q: AeriesCS is taking a long time to start up each time my users login. What can I check to see if there are problems? A: There are four (4) common possibilities. Not knowing what version of Access you are using, the problem suggests an unpatched MS Access 2007/2010. If that is the case, there is a fix for the flashing screen / slow painting of forms listed in the "Microsoft Access and Aeries" section of this page. If you had a previous version of Aeries on the workstations, you may have residual data paths in the old eagle1.ini. Verify that the Eagle1.ini is NOT in the c:\windows folder. Delete all instances of eagle1.ini and allow Aeries to create a new one in the default Aeries folder (usually c:\eagle). Additionally, delete all extra copies of Aeries.mde that are not in the default Aeries folder as well. You have an incorrect path specified for the update, photo, or PAC path. Aeries will try to connect to the invalid path before giving up. You have orphan records in the system that are not taken care of by the AdminCS functions OR you have not run the AdminCS cleanup functions in a while (Force Delete Cascade Records and Database cleanup). You should be running those two functions a minimum of once every two weeks. If none of these rectify the issue, please contact Eagle Support for additional help. Q: How do I setup a new Aeries account to force a password to be changed upon the first login? A: When setting up a new user account in Aeries (all versions), using the temporary password of "welcome" will force the user to re enter a different password. The user can continue to use the "welcome" password, but will continue to be prompted to change the password until the user selects another password. Q: How do I append fix length files together? A: By using DOS copy you can create a single file from multiple fixed length files while keeping the same record layout. For more information type “copy /?” from a command prompt. The following is a sample statement, from the DOS command prompt: copy file1.dat/b+file2.dat/b+file3.dat/b combinedfile.dat/b. The “/b” is to denote "Binary", which will keep ALL formatting information (CR/LF, etc). Q: How do I report a problem or submit a feature request? A: Both can be done online at our support page: http://www.aeries.com/support. Q: Why do I get the message "Not a valid name or password" when trying to login. A: Aeries security login passwords are case sensitive. Make sure you are using lower case, (caps-lock off) if that is how your password is supposed to be entered. If you still can not log in, please contact your local system administrator. Eagle Software does not maintain a list of your district's local credentials. Q: When I start Aeries, my NumLock is turned off. What can I do to have it stay on? A: The following registry entry can be added/modified to rectify this issue. It is HIGHLY recommended that ONLY individuals knowledgeable in changing the Windows registry perform this key modification: REGEDIT, HKEY_Users, Default, Control Panel, Keyboard, InitialKeyboardIndicators set to 2. Q: How do I install Aeries? A: Found in our Downloadable Documents section after logging in, the "Installation Files" category contains installers for several versions of Microsoft Access. Also included is a procedural document to follow when installing Aeries Client/Client Server versions. Q: What should I do if I get the "File sharing lock count exceeded" error in Aeries? A: Modifications to the registry should only be handled by a System Administrator or Technician that is proficient with registry modifications. If you are able to modify the registry, you can reference the Knowledge Base provided by Microsoft by clicking here and apply the information the affected machine(s). Q: Installing Access 2003 and other versions of Access on the same machine. A: Refer to the Microsoft support article here. Q: How does the automatic update process work? A: The update process can be automatic and seamless. The files from the weekly update file (UPDATECS.EXE) are to be extracted to a folder that all users have RUADC permissions. From the school version of access (SCH), in the Aeries form Aeries Variables for Current User the Update Path is to be keyed in the appropriate field. The next time a user logs in to Aeries, the software will run a comparison routine that checks a date field in a table called USYSVER within the SCH.MDE (or DST.MDE) application file. If the latest date on the new files is more recent than the latest date in the workstation copy of SCH.MDE, an application called UPDATE.MDB will run a routine that copies the new files to the proper locations on the workstation. Most districts and clients use this automatic update function, but it is not required. Districts can establish their own update/copy routines if they wish. If you are going to create a custom Aeries updating routine, please contact Eagle Software support for details about which files need to copied where for the various versions of Access and Aeries. Q: My Terminal Services user sessions started having problems after an update from Microsoft. What is the problem? Q: How do I hide / restore the database window for Aeries? A: From the Microsoft Access menu, select Tools, Startup, and toggle the checkbox for "Display Database Window"
Q: When running Aeries in Access, I get a message about macro security. What does this mean? A: Microsoft has implemented a position on security that keeps exposure to viruses, trojans, and hackers at a minimum. As with other products (Excel), Microsoft has defaulted the setting for Macros to a "medium" security setting. The "High" setting will stop all databases/macros not "certified" by Microsoft from executing automatically. The "Medium" setting consistently reminds the user of the threat of potential problems from non-certified data sources. The user is prompted each time a macro is executed about the potential threat and requires the user to confirm the desire to continue the macro execution. The "Low" setting will allow the software to work properly without interrupting messages. Eagle Software recommends for our clients to change the setting to the lowest setting; the warning messages will then stop appearing and Aeries will function properly. To complete this task in Access 2003, click on Tools, Macro, Security, Low. In more recent versions of Access, the area is located in Options, Trust Center, Macro Security. Q: When running Aeries, I get the following message: "This database was created with the 32-bit version of Microsoft Access. Please open it with the 32-bit version of Microsoft Access." What does this mean? A: The 32-bit version of Access must be installed for Aeries to run; if you have the 64-bit version of Office loaded, you must re-install Access as a 32-bit program. A single licensed copy of Microsoft Access allows for both 32-bit and 64-bit versions to be installed, so there is no additional cost to you for this process. Furthermore, you may install Access 32-bit on the same system as other versions of Office, e.g. Access 2003 (32-bit) alongside Office 2010 64-bit. Eagle Software has no plans for developing the Aeries Client version in 64-bit at this time. Q: Is Aeries compatible with Access 2007, 2010, etc.? A: For details on which systems Aeries supports, refer to the Aeries System Compatibility Chart. For Access 2007 and 2010, there is a hotfix to address an issue with form painting speed. You can download the hotfix for 2007 here, and the hotfix for 2010 here. Q: What files should be shared on the File Server, and what files should be on the hard drive? A: All files contained in the Aeries update file (UpdateXP.exe) should be placed in a shared folder on the file server. This includes but is not limited to the following files: SCH.MDE, AERIES.MDE, SCHMODEL.MDB, UPDATE.MDB, SYSTEM.MDW and EAGLE.HLP. The file server should also have any school datafiles that are sharable, e.g. SCH13001.MDB. All other installation files reside on the local hard drive. Q: No computers can connect to Aeries (we share data on the server). A: Make sure you are getting attached to your server(s) at start up. Verify in the My Computer area that your network drives (e.g. F:\) are present and accessible . If you are not finding the network drive, try closing out and logging back on, or reboot your workstation, as this will often re-run your network's scripts to attach shared drives. If this fails, contact your local network administrator. Q: I cannot get my printer to print barcodes as barcodes under the Print Student ID/CARD form. Instead it prints the barcode as @0005000011@. All computers print to the same printer and i tried reinstalling the print driver. A: This error indicates that the font used for printing barcodes is not present on the workstation or server where the printer is installed. You will need to download and install the RSWIDE39.TTF font. We make this font available in every update file that we published on our website (UpdateXP.exe and UpdateCS.exe) To install in Windows, navigate to the Control Panel, click on Fonts, and then drag the font file into the window that appears. This will need to done on each workstation or, if the printer is networked, on the appropriate print server. As with any new font, you will have to reboot after installation. Q: How do I set up a dot-matrix/ line printer with Aeries? You need the Generic Text printer driver loaded on your machine. This should not be your default printer. These drivers are included with every modern version of Windows. Under the properties for the generic text printer, you need to go to the details tab, spool settings, and select Print directly to printer. Under the Paper tab of the printer settings, the page size should be US Standard Fanfold. Also, under the Paper source tab the paper needs to be set to Continuous - No page break. Aeries will automatically set the driver to the generic text when using one of our "generic" reports, all you have to do is have the driver installed on the system and have the settings as described above. Q: How do I convert my Aeries database from Access 97 or Access 2000 to Access 2002(XP)/2003? A: Use the following link for instructions. Upgrade Access 97 or Access 2000 to XP. Q: How do I setup Aeries to work with Terminal Services? A: Although AeriesCS is not designed as a "Terminal Services Application", and while Eagle Software does not promote usage of AeriesCS as a TS app, it will work in a TS environment. Our support employees do not assist in this type of setup, but the following instructions can be followed by an experienced network administrator. As a workstation-oriented application, the files used to start the AeriesCS interface are not to be shared across multiple TS users. Each user logging in needs to use their own set of files (specifically, SCH.mde, SCHMODEL.mdb, UPDATE.mdb, AERIES.mde, and SYSTEM.mdw). This type of environment can be accomplished by setting up the AeriesCS interface for each user profile as if the virtual workstation is a local PC. There are two ways to setup an AeriesCS workstation: 1. Run the installation package available from our website (InstallCS.exe) for each individual user profile. The installer prompts for file placement locations, which will have to be different for each user. This may be a lengthy process if you have several (more than 20) users. The installation package extracts the necessary files into designated folders (typically the C:\eagle folder) and creates an icon for starting the AeriesCS School interface. Alternatively, run the installer once on the server (or some other designated location) and then copy the installed files in the designated drive:\foldername\location, as well as the shortcut created in the AeriesCS program-files area, to each user profile folder utilizing Windows login scripting. If desired, you can create an EAGLE1.ini file to distribute during the scripting process by starting AeriesCS on the "installed" designate and then copy the EAGLE1.ini file to each virtual workstation profile. This file can contain the necessary login credentials, as well as the updated file location to perform the automatic update process. Hopefully this helps you to accomplish your goal. At present, there are no immediate plans to develop a terminal services setup process or to offer support in installing such environments. The above details are therefore the best resource available to accomplish a terminal services environment that uses AeriesCS. A: This is related to the security settings on our FTP site. Make sure that your connection entry indicates “TLS Explicit” for the encryption type. “TLS Implicit” or any other method will not work. You may also receive this error if you do not accept the security certificate prompt upon first connecting from a new server. Q: I am trying to send a file to the FTP site, but I get one of the following errors: “550 Cannot STOR.”, “The filename is banned”, “Critical file transfer error”. A: Our FTP site only accepts files that have been archived, with the file extensions of .zip, .rar, and .7z; if you are trying to send a .BAK or .MDF that has not been compressed into an archive file, the FTP site will prompt the above error(s). Please ask your system administrator for assistance if you are not familiar with the compressing process. Q: My transfer is taking a very long time to complete, why is that? A: Transfer times are directly related to one or both of the following items: bandwidth and file-size. In regards to bandwidth, Eagle Software has taken steps to increase the connection performance for our FTP site’s transfers, but there are still instances where your district’s internet connection may be overwhelmed by an active user base or otherwise slower than industry standards. As for file-size, and this is true even for those without bandwidth limitations, transfers involving items larger than 5 GB are typically an indication that you did not truncate or otherwise remove your SQL transaction log from your backup file before sending. We have seen many instances where a backup file was over 95% log file which is of no use to Eagle Software when troubleshooting support issues. If you would like to decrease file transfer times, consider sending only a copy of the .MDF database file or a .BAK backup file with the SQL transaction log file truncated. Q: I sent my SQL server’s most recent backup file but the support representative cannot use it, why is this? A: Your district may utilize what is known as “Differential” or “Transaction Log” files to maintain its SQL server backups. These files represent small changes that require a full database to restore into, an integral part of your server that Eagle Software does not own or operate. When sending backup files, it is crucial to send a recently created “Full” backup file or a copy of the .MDF database itself. Q: My SQL server crashed and I have no recent copy of my data, can you send me what I sent you last? A: Eagle Software does not maintain customer data for more than a brief period, related to your support inquiry. We offer an ASP hosted solution for customers who wish to eliminate the headaches of SQL server maintenance.